London Zoo (Zoological Society London) opened on 27 April 1828 as the world's first scientific Zoo and opened to the public in 1847. (We've heard that London Zoo is so old it is actually where the word 'zoo' originates from.) The zoo's focus is on conservation and it has one of the largest collections in the UK with 806 species of animals (19,178 individuals). It has many long-term breeding programs as well as extensive education programs. Decimus Burton was the Zoo's official architect from 1826 to 1841 and laid out the grounds which includes some iconic architecture. Burton also designed Wellington Arch and The Temperate House at Kew Gardens. Many other leading architects have since contributed to the built environment of the zoo, creating a collection of buildings that includes two Grade I and eight Grade II listed structures. ZSL London Zoo is constantly improving and adding new exhibits to give the animals more space and visitors a better understanding of the way the animals live. Instead of rows of cages, there are more 'walk through' exhibits with the animals free to explore such as Rainforest Life, Meet the Monkeys, and In With The Lemurs. London Zoo is run by The Zoological Society of London (ZSL), a charity devoted to the worldwide conservation of animals and their habitats. The world's very first aquarium opened at London Zoo in 1853. They actually invented the word 'aquarium' - a shortening of 'aquatic vivarium', the old name for a fish enclosure. The aquarium was moved to its current large building in 1924. It has three big halls and is 150 yards long. London Zoo has been used as a Harry Potter Film Location in London. London Zoo is open every day of the year except Christmas Day (25 December). Opening times do vary throughout the year and are often extended for bank holidays. Last admission is one hour before the advertised closing time. Walk up Parkway until you reach Prince Albert Road. Turn right and walk past the Feng Shang Princess (Floating Chinese Restaurant) on your left) and continue until you reach the traffic-light controlled pedestrian crossing. Cross and walk over the Regent's Canal footbridge (St. Mark's Bridge). Turn right and London Zoo is a minute away on the left-hand side. For details of alternative public transport routes and a map of the area see the London Zoo website: How to Find Us. You can book Skip the Line London Zoo tickets through Viator. Buy a London Pass which covers entrance charges to lots of top attractions for a set fee. 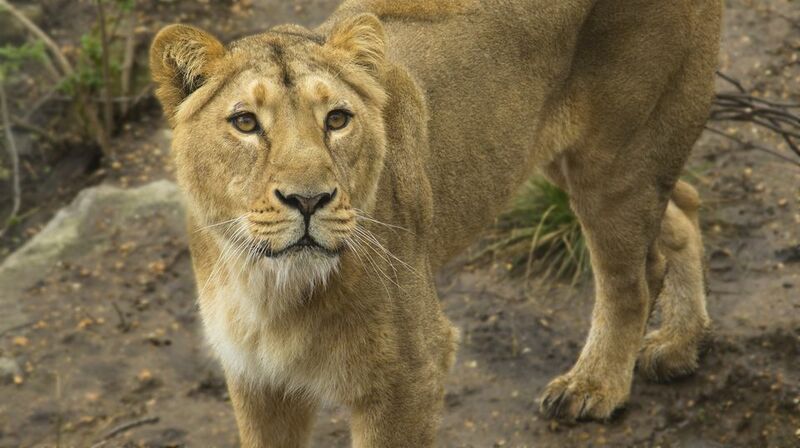 Check leaflets about London Zoo at other major attractions and London hotels as they can have money off coupons. Ticket prices include a small voluntary donation towards the conservation projects. You can opt out and save money. Buy A Gift often have discounted London Zoo tickets for online booking. Online Booking Tip: If you book online through the official website the payment card used to purchase the e-ticket must be shown to collect the tickets. If you need to use someone else's card then buy Gift Tickets for the same price. Queuing Tip: The queues for tickets are usually long so be prepared to wait, or buy in advance (see above). Another frustration is if you go with a friend who doesn't have a ticket and you already have your ticket, then you have to join different queues to enter. Really, I've found they won't let you in the wrong entrance even if you have waited in line and have a ticket in your hand! There are lots of toilets throughout the zoo complex. The busiest is usually nearest the entrance and at the Oasis Cafe so try and head further into the Zoo to avoid queues. All toilets have baby changing stations including the men's toilets. On busy days I have seen plenty of men being sent in to change the baby. At weekends, on bank holidays, and during UK school holidays, this large cafe is seriously busy. Throughout the year it is best to try and have an early or late lunch. They serve a wide range of hot and cold food and plenty of healthy options. They offer a children's lunchbox which is very popular. For the younger visitors, highchairs are available, plus there is a microwave available for warming baby food or milk. There's also a smaller cafe next to the Old Penguin Pool and accessible from Animal Adventure. Opposite The Terrace Restaurant is a playground divided into under 5s and 5-14-year-olds. This is a great space to let the kids go wild so you can enjoy your picnic lunch. There's a carousel too. The main gift shop is in Barclay Court near The Terrace Restaurant. They sell lots for all ages and price ranges, with plenty of 'pocket money' toys. There is another smaller shop near the Old Penguin Pool and Animal Adventure which is usually much quieter. Never feed zoo animals as it can be dangerous and you can make them sick. All the animals are fed a diet that suits them individually so never offer them food. It is best to keep your food in a bag so as not to distract the animals. Plus the Animals in Action Amphitheatre shows with birds and small animals are a great opportunity to see the animals out of cages. Events are always popular so arrive early to get a good view. To find out what's on. You can easily spend a whole day at London Zoo and still not meet all the animals. Here are some of the recommended highlights. Near the entrance, you'll find the Aquarium which is huge and has 3 halls. (Tip: It's dark inside so hold onto the kids.) Also, the Reptile House where Harry Potter spoke to a snake, and the Gorilla Kingdom which brings you up close to a group of Western lowland gorillas. My favorite architecture is the Lubetkin Old Penguin Pool, Snowdon Aviary, Casson Pavilion with the camels, and Mappin Terraces. On the other side of the tunnel, you'll find Rainforest Life and Into Africa where you can see zebras, giraffes, and much more. Access Tip: There is a lift (as well as stairs) down to the Nightline to see nocturnal creatures such as the slender loris. London Zoo is in Regent's Park which means there are a few places you can see into the zoo for free. If you walk along Regent's Canal you can see some of the Into Africa animals and the bird aviaries. Cross over Primrose Hill Bridge (over Regent's Canal) to see Red River Hogs and okapis (Into Africa). And for my favorite, walk along the Regent's Park Outer Circle, past the London Zoo entrance, opposite the West Service Gate, and see the giraffes.